Drama. The colourfully named “Ring of Fire” is a nearly inaccessible water-logged and unforgiving terrain between Thunder Bay and James Bay in Northern Ontario. The region is said to contain vast resources of nickel and copper, some gold and platinum, and a massive deposit of the mineral chromite (National Post, December 12, 2012, Will [The] Ring Of Fire Ever Burn?). Although chromite is not in short supply world-wide, Cliffs Natural Resources Incorporated of Cleveland, Ohio, is planning to spend about $3 billion to develop its Black Thor chromite deposit into two open pit and an underground mine over the next thirty years and the Province of Ontario has already negotiated a deal with Cliffs to build a smelter near Sudbury (please see Postscript below). Alas, it’s evident from the Risk Price Chart (please see Exhibit 1 below) that we can’t get involved at the present time despite a current dividend of $2.50 per share or $360 million per year and a current dividend yield of 7%. One wonders too that the P/E (price to earnings ratio) is less than four and that the current market value is less than the book value which will undoubtedly create a burning desire for the stock in some people’s portfolios at “bargain” prices more or less (please see our Post, The Active Investor (DOA), November 2012). We don’t know the future but in our view, the current downside due to the demonstrated stock price volatility is $12.50 (please see our Post, Popoviciu’s Volatility, September 2012) and we would, therefore, not be surprised at any price between $24 and $48 for the stock during the next several months. To counter that, we note that the April 2013 put options at $36 are selling at $4.40 per share today and the cost could be partially offset with a short or sold call at $39 for $2.40 today so that for a net cost of $2 per share ($4.40 less $2.40) we could anticipate no less than $36 and no more than $39 per share for our position (if we had one) for the next three months. The current Risk Price (SF) is $56 and has been declining steadily since 2010. The Risk Price (SF) is a defensible “takeover price” should someone “like” the company well-enough that they’d want to buy all of it. Please see our Post, The Price of Risk, August 2012. 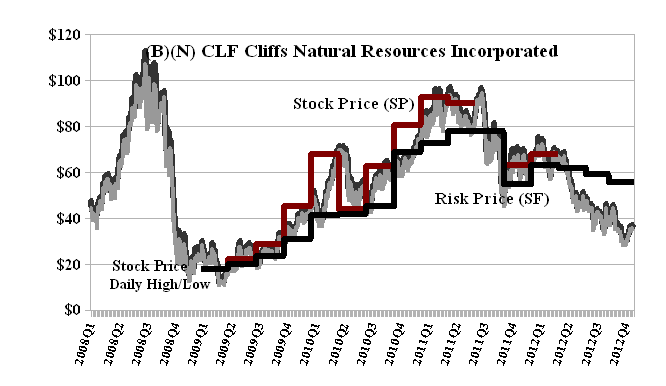 Cliffs Natural Resources Incorporated is a mining & natural resources company that produces iron ore pellets, fines and lump ore, and metallurgical coal. In May 2011, Cliffs completed its acquisition of Consolidated Thompson Iron Mines Limited and financed the approximately $4.9 billion transaction (including net debt) through committed financing, including a $1.25 billion term loan, $750 million in bridge financing and available cash on hand. Cliffs has since replaced the bridge financing by accessing the capital markets. The provincial government has jurisdiction over natural resources and mining, and many of the permits needed to develop the “Ring of Fire” will come from Queen’s Park. The federal government has responsibility for aboriginal affairs and Ottawa also conducts environmental assessments of the road and mining developments, and will likely help fund some of the infrastructure needed to make the projects viable. The Ring of Fire is spread over the traditional lands of the Marten Falls and Webequie First Nations, and will likely affect the lives of people living in Fort Hope, Neskantaga, Attawapiskat, Aroland and Nibinamik. They are among the most disenfranchised communities in Canada, dealing with low levels of education, huge levels of unemployment, poor education, suicide and rampant drug addiction. Most of the communities are reachable only by air or winter road (The Canadian Press, December 27, 2012, The main characters in the Ring of Fire mining drama in northern Ontario).